An apple pie without the cheese is like a kiss without the squeeze, or so the saying goes. I've never had a slice of apple pie with sharp cheddar, but I'm definitely not opposed to it. I mean, it makes sense... buttery flaky crust, sweet and spicy apples paired with a slice of salty creamy cheese? I can get behind it. But do you place the cheese on top, or is it eaten on the side? Is it sliced or shredded? Would it be wrong to try Gouda instead of cheddar? So many questions.... definitely overthinking this cheese and apple pie thing. I've only eaten apple pie a la mode with vanilla or cinnamon ice cream, which is kind of hard to beat. 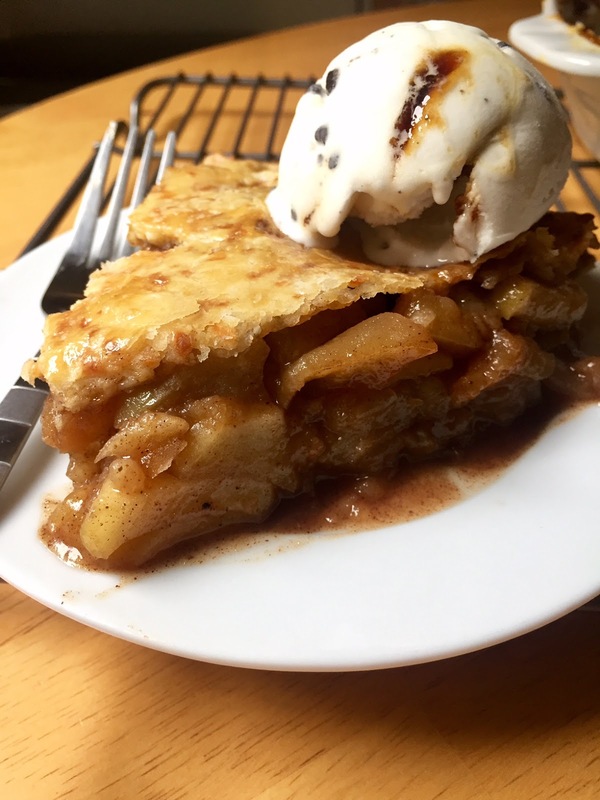 But now I can get my ice cream AND cheese with this apple pie I baked. Yayyy calcium! Let's postpone all of the pumpkin desserts for now... there's plenty of time for that; we have three more months, people. We should enjoy apple season while we can and September is a great month for apples. 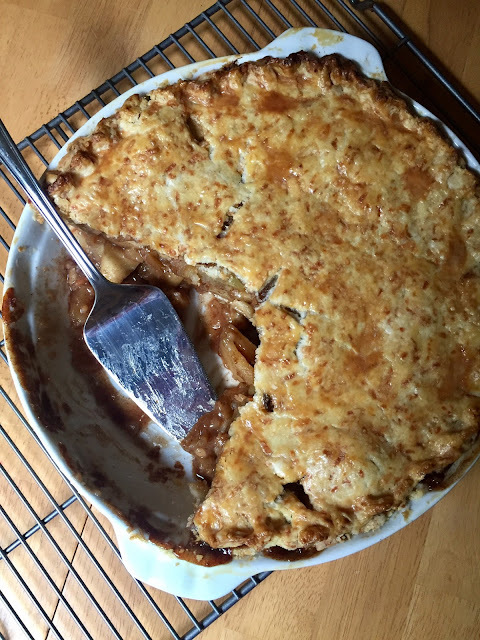 I used Ginger Gold apples in this pie, but use whatever you'd like, as long as they're somewhat tart and can hold up to baking. The filling is traditional - sugar, more sugar, spices, good vanilla. The crust is the star of this pie because it has finely shredded sharp cheddar in it. I think it turned out well, and not toooo cheesy. Serve avec glace à la vanille! C'est délicieux! To make the pastry, in a large mixing bowl, sift together flour, sugar and 1/4 teaspoon kosher salt. Cut in cold butter until well incorporated and dough forms pea-sized lumps. Stir in cheese. Stir in ice water, a tablespoon at a time, until dough starts to come together. Form two balls of dough and shape into discs. Cover in plastic wrap and chill at least 30 minutes. To make the filling, melt butter in a large skillet over medium heat; stir in apple, brown sugar, granulated sugar, cinnamon, ginger, clove, and nutmeg until well combined. Stir and cook apples until softened, and sugary syrup starts to thicken - about 10-15 minutes. Place apples in a large bowl, stir in vanilla, and refrigerate until room temperature. Roll out one pie dough disc onto a lightly floured surface, into a 9-inch thin round; transfer to the bottom of a pie dish. Place cooked apples into the center. Roll out additional pie dough round and place on top; pinch edges to seal. Cut a few slits into the center of the pie. Brush lightly with egg wash, if desired, for a shinier crust. Sprinkle with additional 1/4 teaspoon kosher salt. Chill in refrigerator until oven is preheated. Heat oven to 400 degrees F. Bake pie for 30-40 minutes, or until golden brown and bubbly. Cool on a wire rack for at least an hour before slicing. 3 comments on "Apple Pie with Sharp Cheddar Crust"
The first and only time I've had apple pie with cheese was when I was 12 years old. My mom, sister and I were flying to New York and my mom offered us up to be bumped on an overbooked flight out of Denver. They ended up not needing the seats, but as a thank you they upgraded the three of us to first class. My sister and I were all, "What? Cheese with pie?!" And just ate it separately. 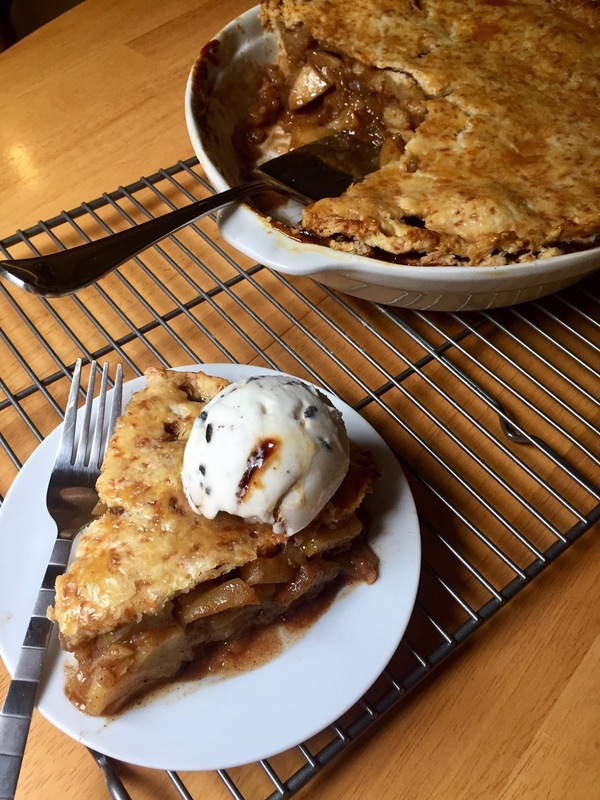 Oh my gosh, your apple pie recipe looks and sounds so delicious, you have me planning an apple picking trip for next weekend! Tis the season and you are so right that there's lots of time later for pumpkin desserts, I just made a summer peach pie two weeks ago!